We see a lot of industrial end users moving beyond facilities-based energy management to process-based energy management—that is, mitigating energy loss on the process floor, since that’s where the majority of energy is used. Not every manufacturer is ready for this step however…it’s clear that an energy management program matures over time through three distinct phases. 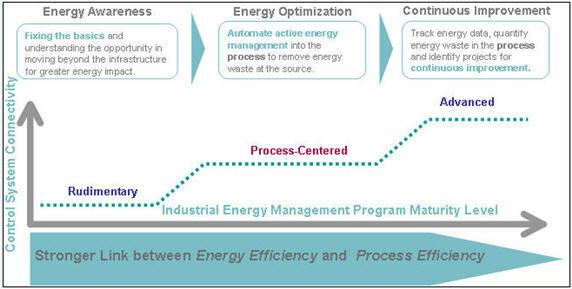 The model shown in the figure below represents three primary phases of energy management program maturity levels in a process facility. On one end of the scale is the “rudimentary” level, where the building systems are the primary focus of the energy management initiatives. In the “process-centered” stage, energy management initiatives move to the production area, but are primarily based on equipment modifications, such as machine-level metering, high efficiency motors, variable frequency drive integration, and idle state control. In many cases, some of these energy-centric modifications actually result in increases in process efficiency as well. For example, equipment that runs less often and at slower speeds than production schedules tends to break down less and causes fewer unplanned work stoppages. The “advanced” level, however, is where the substantial benefits can be realized. In this phase, energy and process data are correlated to provide a unique visibility in which energy is measured in the “context” of production output, in units that resemble other production inputs, such as kWh per widget, or BTU per million gallons, or kWh per ton. This contextual energy is then tracked, trended and analyzed to support continuous improvement initiatives. What’s key about the advanced-level energy management program is that it requires a strong technical and logical link with the process automation system and when deployed, process and energy metrics are most effectively combined at the visualization system through what is typically called the “Energy Management Dashboard”. Where is your facility/organization on this scale? In my next blog, I’ll talk about the 5 steps to transitioning from facilities energy management to process energy management. 5 Steps to transition from “Facilities” Energy Management to “Industrial Process” Energy Management The next BIG THING for Industrial Energy Management is BIG DATA: Get Ready! 5 potential mistakes to avoid when implementing an energy and sustainability management program Where Are You Along the Power Distribution Equipment Maintenance Maturity Scale?